ORLANDO, Fla. – Jon Gruden has high hopes for Amari Cooper. The new Raiders head coach previously lavished praise on the young receiver, saying he'll be the central offensive skill player in a new passing attack. Gruden's kind words continued Tuesday morning at the NFL owners meetings, when he compared Cooper to a Hall-of-Fame receiver Raiders fans know well. 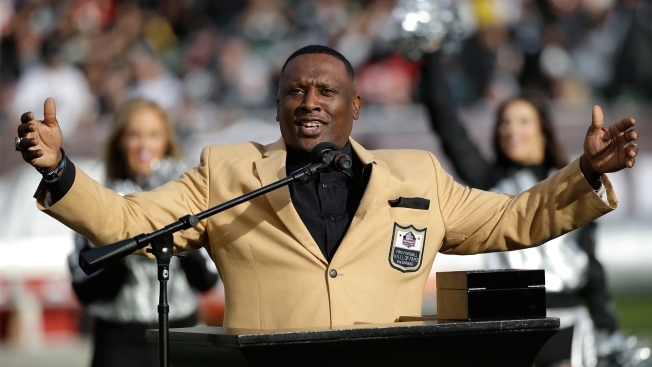 "I said it when he came out of Alabama, that he reminded me of a young Tim Brown," Gruden said. "He has that type of game speed. He's elusive, and has a wide range of routes he can run. He's flexible. It'll benefit him to stay healthy and stay in the same system for a few years. If he does that, great things are ahead." Cooper's stats took a downturn in 2017, following 1,000-plus yards in his first two NFL seasons. He had just 48 catches for 680 yards while dealing with injuries down the stretch. That has been a common theme during Coopers three years in the league, something he hopes to reverse in 2018. "He has to get healthy and stay healthy," Gruden said. "We need him to be the player he was the first two years. I've said it earlier. We're going to make him the main vein of our passing offense and move him around a lot. "…We are really excited about him. I think he's entering the prime of his career. " Gruden talked about a ton during the annual coaches breakfast, where all 32 head coaches are available to the media for a full hour. Here are some other notes from that marathon session, some of which will be unpacked in greater detail as the week progresses. -- Gruden is clearly over being asked about his working relationship with general manager Reggie McKenzie, though Gruden has more influence than any coach in the Mark Davis area. "It's been great," Gruden said. "…He's a great guy. If you can't get along with Reggie McKenzie, you can't get along with anybody. We both realize there's a sense of urgency. Mark Davis and the Oakland Raiders want to win. We want to improve the roster, improve the product on the field." -- Left tackle Donald Penn is still recovering from Lisfranc surgery on his foot. Gruden said he'll be out a few more months. He'll miss OTAs, with the goal of being ready by training camp. Penn is three pounds below his playing weight, and is confident in the Raiders patient approach to rehab. Gruden called Rodney Hudson "my favorite Raider right now." He loves the center's effort and ability to get downfield on run and pass plays alike. -- The Raiders right tackle job is currently open, but Gruden said recent free-agent signing Breno Giacomini is a frontrunner at this stage, though the Raiders could add another tackle in the NFL Draft. Gruden praises Giacomini's toughness, and said he hopes the veteran's physical nature and competitive drive "permeates" throughout the offensive line. -- Gruden has been impressed with Derek Carr's ability to read defenses, but says "we have to block better," and give the quarterback more time and confidence working from the pocket. -- Marshawn Lynch will be the Raiders feature back, but there's an open competition behind him. Doug Martin will have a chance to earn a significant role, as will others on the roster. Gruden didn't rule out drafting a running back this year, saying this 2018 class is deep and talented. Expect some flux in the running back depth chart. -- Gruden praised secondary coach Derrick Ansley, said he's the perfect fit to get the most out of Gareon Conley and Rashaan Melvin.